Now is the time for many of us to start thinking of vacation or planning and I thought I’d talk a little bit of another very important book that travels with me… my travel journal. 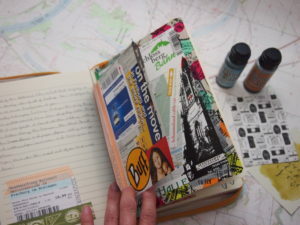 I’ve had several travel journals in the past but the one I’m currently using is not one I’ve made. Instead I just bought a 5 1/2 x 8 lined journal from Barnes & Noble and I’ve altered it quite a bit. I used to only write in my journals but over time they’ve become scrapbooks/altered journals and I like that because I can also capture other items that will remind me of my travels. My set up starts with a book jacket. My journal fits perfectly in this handy pouch that zips up so nothing falls out. It has pockets outside and inside so I can stash away supplies, paper pieces and other small things. Some of the things I definitely take with me are colored pens. I especially love my Stabilo pens. I also must have a glue stick – I’m partial to the UHU sticks – because I like to tape things into my pages. Saving a receipt, a map or a piece from a brochure is a great way to remember how much things cost, where you went for lunch, etc. Washi tape also comes in very handy. The trick is narrowing down to just a couple of rolls to take. I also have an Instax camera that I use so that I can have some instant pictures to add to my journal pages. The spine on this journal has already cracked because I’ve added more bits and pieces to pages but it just adds more character don’t you think? Plus, once I’m done with this journal I can add a bit more tape to the spine. Some other supplies that I like to take with me are my Ranger Ink distress stains (those don’t quite fit in my book jacket but they are small enough for my backpack). I also take journaling cards, various pens and small craft scissors. Oh and stickers, I love stickers. 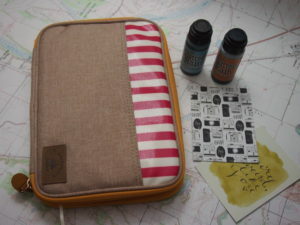 This set up also works for those of you who like to take your journaling outside of the house. Maybe you like to go sit in a cafe or a park and journal. So if you do this what supplies do you take with you? Let me know what some of your tips and tricks are as I can always use more. I hope this helps you put together your on the go journal! I always WANT to journal when I travel, but I usually start days too late and then have to play catch up so really only journal the first day of the trip. 🙂 I LOVE that zippered pouch! I just recently started bullet journaling and I would love to have a little carry case to take it with me on the go. I like the way you have customized this to make it your own! It will make documenting your trip more fun! You just gave me the best idea! A glue stick! We are leaving on a big journey tomorrow, so this was so timely. I like to keep a travel journal on the rare occasions we actually travel. 🙂 Mine is very simple. I love yours. You are very prepared! Your journal is awesome and I love the case you carry it in! 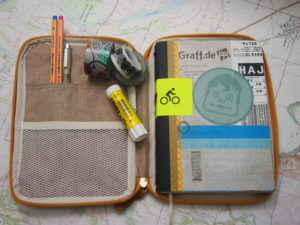 Very nice travel journal! It’s a great idea. And I like the Oscar Wilde quote 🙂 Safe and happy travels! Thank you so much for sharing this post! I don’t keep a travel journal but lately I have been considering keeping one. Mostly I just write my travel entries in an app so this is a wonderful alternative I would like to adopt.